Antigen: The target protein is fused with two N-terminal Tags, His-tag and its sequence is listed below. 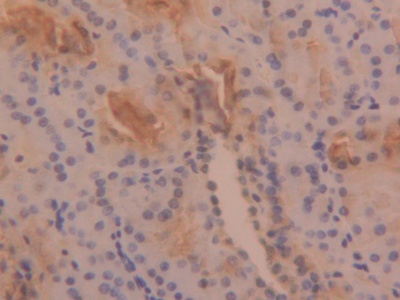 The antibody is a rabbit polyclonal antibody raised against TPS. 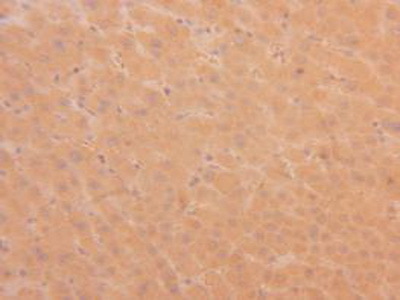 It has been selected for its ability to recognize TPS in immunohistochemical staining andwestern blotting. Recombinant TPS (Gly161~Tyr262) expressed in E.coli. Small volumes of anti-TPS antibody vial(s) may occasionally become entrapped in the seal of the product vial during shipment and storage. If necessary, briefly centrifuge the vial on a tabletop centrifuge to dislodge any liquid in the container`s cap. Certain products may require to ship with dry ice and additional dry ice fee may apply. Western Blot: Sample: Mouse Intestine Tissue. 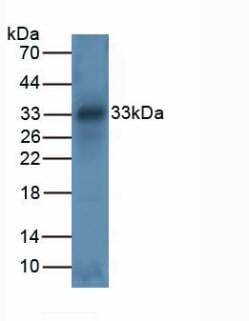 Western Blot: Sample: Recombinant TPS, Human. 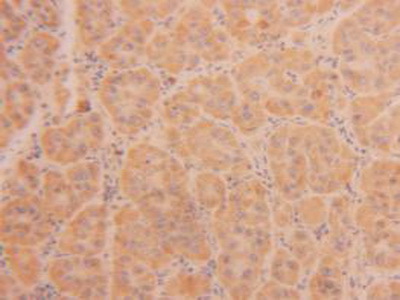 DAB staining on IHC-P; Samples: Human Liver Cancer Tissue. NCBI/Uniprot data below describe general gene information for TPS. It may not necessarily be applicable to this product. TPSAB1: Tryptase is the major neutral protease present in mast cells and is secreted upon the coupled activation-degranulation response of this cell type. Belongs to the peptidase S1 family. Tryptase subfamily. 2 isoforms of the human protein are produced by alternative splicing. 1. Increased TPSAB1 copy number is associated with multisystem disorder.